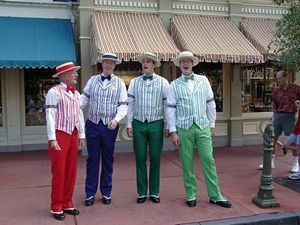 The Dapper Dans barbershop quartet stroll down Main Street daily, singing melodious tunes in perfect harmony and entertaining guests with their humorous banter. The quartet also perform at the Main Street Barbershop. Check the Times Guide for the day's performance times and locations. Let them know if you're celebrating a special occasion, such as a birthday, or honeymoon. The Dapper Dans originated at Disneyland, and have had over 100 individual members through the years.